Sometime around Christmas 2016, Stockade released what was quite possibly the most special beer to have come from their MacArthur Grange brewery, whether under their own name or the many brands for whom they’ve brewed beers over the years. It was called Old Money and it was a small portion of their World Beer Cup trophy winning Russian Imperial Stout that had been kept aside in whisky barrels for two years to become a 15 percent ABV monster and a magnet for those chasing rare beers. Around a year later, they’ve released a new batch of Old Money. Based on the original recipe but with a fraction of the gestation, the 2017 version comes in at a comparatively approachable 12.5 percent ABV and, indeed, it's more approachable in general; where the first edition was markedly rich and boozy, this one brings with it a sweeter side. In terms of character, it’s not too far off Port as far as the dried fruit is concerned and that’s complemented by a smooth toffee flavour. Having been aged for six months in Woodford Reserve Kentucky bourbon barrels, it certainly carries the spirit but maintains a sense of balance, becoming ever more surefooted as it warms. 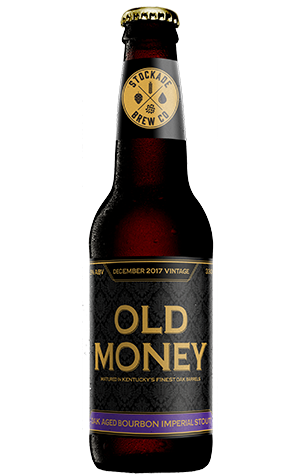 Throw in the requisite dark chocolate and coffee characters of the malt and, if you’re into beers that sit on the strong and sweet side, Old Money is the kind of affordable luxury of which you’ll want to grab a fistful.